What you need to do is just select the presets then tweaking a few knob and done. Your track get polished like a pro instantly. Nowadays mastering a song is as easy like ABC with Mastering audio software. Ya! say thanks to those audio software developers. Because literally, mastering a track is very hard to do it manually. To mastering a track from scratch, you must have a great “ear” to make it sounds good. You have to find the track tone and frequencies balance right before you can crank the volume etc. And that’s, need a long time process for you to get the skill of Mastering a track/song like a professional engineer. As you know, that in mixing process you have to lower down the master volume in your mixer to prevent clipping. So you need to Mastering process to get your track volume louder as it standard track loudness on the industry out there. Mastering is also a process in adding a track color, cut unnecessary or boost the frequencies that you desired. And like I mentioned before, the mastering process is not an easy task if you do it manually from scratch. But, we are lucky because these two audio softwares can do it for you almost instantly. And here they are! Okay, there is a lot of audio software for mastering track after final mixing process out there. But in this post, we only put two of them. The best if you are working in your home recording studios. Toontrack EZMix especially EZMix 2 is the best audio software for you to instantly mastering your tracks. It is a multi tool that you can use it as VST plugin or standalone application. You can also use it as guitar or bass amp simp, virtual vocals rack effect, mixing tools and mastering tools. 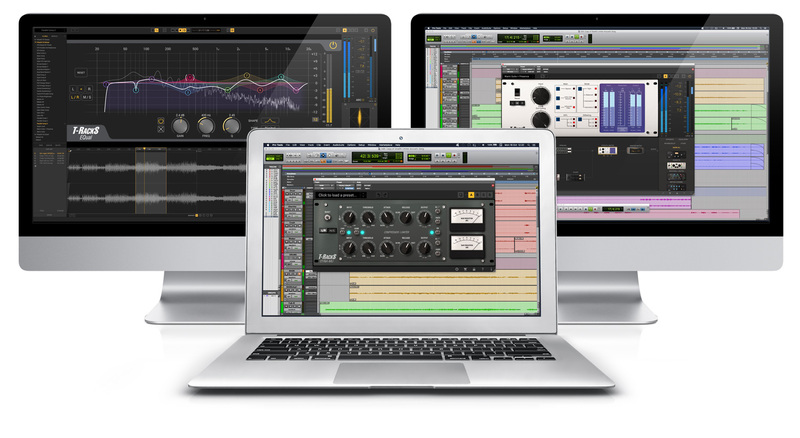 For mastering purposes, you also need to buy the mastering bundle to use it in EZMix software. Then, you can choose the presets that suit with your music genre and sound that you prefer. EZMix is great plugin for instant (One click) track mastering if you are not an audio mastering engineer. Just select the preset and if you prefer you can tweak a few knob for adjusting the sound that you desired. And voila! you are ready to export your track as Mp3 etc. For more info and to check the EZMix price please visit Toontrack website for more info and other new stuff. Unlike EZMix, IK-Multimedia T-Racks is for both purposes. Whether is for DIY audio mastering and also for instant” audio mastering. For engineer or for non mastering engineer. Since with T-Racks, there is also ton of preset that ready for “instant” track mastering. T-Racks also can be used as a VST plugin on your DAW or use it as a standalone application. Inside the software there is available a very basic mastering tools and mixing effects unit such as Compressor, EQ, De-Esser, Limiter, Reverb etc. So if you plan to learn more deep on how to DIY mastering rather thanes presets. Than maybe T-Racks is great choice. For more info about the software or if you want to check the price before buy the software, you can go to IK-Multimedia T-Racks web page. Or alternatively you also can check the T-Racks price at Amazon. That’s how you can mastering your tracks instantly with these both mastering audio software. The price is worth it if you don’t want to pay for an audio engineer to master your track. And yeah it’s also worth to have if you are serious of making music. Basically for mastering a track you only need this tools: De Esser, Compressor, EQ, Saturation plugin and Limiter. And usually, these plugins is already available inside the DAW software. But if you don’t want your final mixing screw up. Than T-Racks and EZMix both are best for mastering your track easily. And get the Pro Audio result instantly. Please take a note that I am not endorsed by Toontrack and IK Multimedia to write this post. It just for reference only. However, the Amazon link above is my affiliate link. So if you buy from Amazon.com I’ll receive affiliate commission. Not much, but thanks for your support.